Despite starting off with the tragic death of Georgian luger, Nodar Kumaritashvili, and being trashed in the foreign press for all the misfires, Vancouver breathed a collective sigh of relief this weekend as the Winter Games came together. Athletic accomplishments and personal bests were set with Team Canada winning 14 gold medals for the Winter Olympics. Sidney Crosby to the Rescue: After leading the charge for most of the gold medal hockey game, Team Canada gave up a goal (with less than a minute to go) to send the game into overtime. Team USA had the momentum and Ryan Miller, but Nova Scotia’s Sidney Crosby saved the country from a collective nervous breakdown (does Sidney have a girlfriend?) The New York tabloids are calling him “Sid Vicious” but he’s just Sid the Kid to us. In today’s world, men wear makeup. 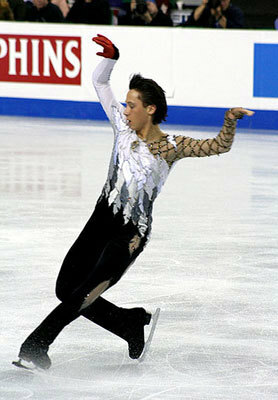 Especially men involved with figure skating. If you had to get tips from any of the figure skaters on Team USA, Johnny Weir would probably be your go-to makeup guy. StyeList asked the flamboyant skater which makeup product he wouldn’t be caught dead without when skating. Instead of naming one product, Weir offered these five top sellers for those of us who live and work on and off the ice. What do Wall Street bankers do after a stressful day of watching the Dow Jones Industrial Average dip and jive? They turn on the Vancouver 2010 Winter Games to check out the latest curling match. According to the New York Times, curling is like “chess on ice,” which even appeals to the CNBC crew who replace market chatter with curling when the closing bell rings.